The show, which airs locally on MyINDY-TV 23, pits two families against each other in a contest to name the most popular answers to survey questions. IU McKinney School of Law graduates Kameelah Shaheed-Diallo and her brother-in-law, Ahmed Young, along with Shaheed-Diallo's sister, IU School of Education graduate Mariama Shaheed Carson, are teammates for the game show. 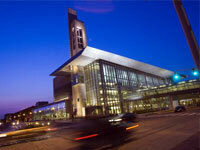 Shaheed-Diallo graduated in 2004 from the law school on the IUPUI campus; Young is a 2011 graduate of the law school. Shaheed Carson earned her master's degree from the School of Education in 2007. Shaheed-Diallo and Shaheed Carson’s sisters NNeka Shaheed and Jasmin Shaheed-Young round out the five-member Shaheed "Family Feud" team. Mariama Shaheed Carson is the wife of U.S. Congressman Andre Carson. The Shaheed sisters are the children of Judge David Shaheed, who is a 1984 graduate of the law school. Judge Shaheed is the presiding judge of the Marion County Superior Court, Civil Division 1. From left: Ahmed Young; Jasmin Shaheed-Young; Kameelah Shaheed-Diallo; "Family Feud" host Steve Harvey; NNeka Shaheed; and Mariama Shaheed Carson.